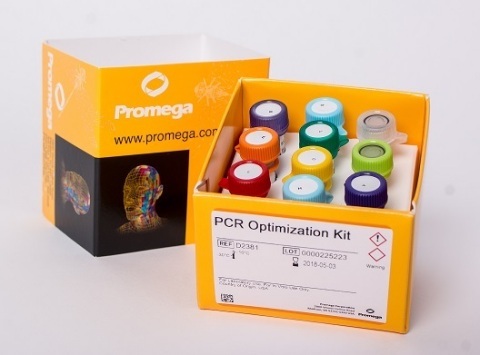 Now available, the Promega PCR Optimization Kit allows customers to rapidly define their own unique PCR master mix manufactured under cGMP for research or clinical use. The user’s defined optimal solution may then be ordered from Promega at any time with a unique part number as a custom cGMP master mix for shipment within ten business days. The PCR Optimization Kit includes magnesium chloride, GoTaq® MDx Hot Start Polymerase, and eight PCR buffers with an array of performance characteristics all manufactured under cGMP. The accompanying user guide provides instruction to quickly isolate the ideal configurations for a variety of PCR applications. Early access users have identified their ideal PCR assays in as little as one month from receipt of the PCR Optimization Kit. And because the components of the PCR Optimization Kits are available in product inventory, Promega can supply additional components as needed for special purposes, such as identifying a master mix that will work across multiple applications. Promega Corporation is a leader in providing innovative solutions and technical support to the life sciences industry. The company’s 3,500 products enable scientists worldwide to advance their knowledge in genomics, proteomics, cellular analysis, drug discovery and human identification. Founded in 1978, the company is headquartered in Madison, WI, USA with branches in 16 countries and over 50 global distributors. For more information about Promega, visit www.promega.com.